cofounder Christopher Gergen, "but they weren't talking with one another." He hadn't heard of WE Labs, for instance, nor had Brown heard of HQ Raleigh. Gergen and others are starting to coordinate nationally with the Forward Cities Collaborative—an affiliation of organizations and activists in Detroit, Cleveland, New Orleans, and neighboring Durham, NC, that trade ideas on business development in low-income and minority neighborhoods. "If you're a WeWork—which is in major metro markets like New York and Chicago and San Francisco, Hong Kong, Berlin, et cetera—it has a very different mandate and a very different strategy for where it's going to go," says Gergen. Communities outside the major commercial centers may have different types of businesses, he says. Health care and food and beverage companies are big in the Southeast, for example. HQ Raleigh's tenants include the venture arm of green household products company Seventh Generation, a coffee roaster, and plenty of tech startups. 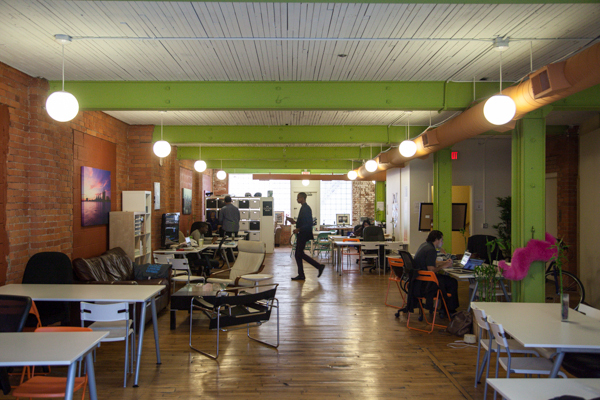 Ponyride opened in the hip Corktown neighborhood of Detroit in 2011 as a maker space and light industrial facility, with small businesses, including a furniture maker, clothing manufacturers, and a screen printing studio. "I would say in the ecosystem of Detroit we're in the middle of the road of taking someone who maybe started a business in their basement or their kitchen and are ready to expand," says Amy Kaherl, director of programming. Kaherl is also a long-time tenant and director of Detroit Soup, which hosts dinners to raise money for creative projects pitched at the events. Detroit Denim, for instance, joined in 2012 with one employee renting 400 square feet. Having grown to eight employees, it recently moved to a new location with 8,000 square feet. A nonprofit called "The Empowerment Plan" makes a coat from recycled materials that converts to a sleeping bag for homeless people; it mostly hires women from shelters, whom it helps get housing and further education. Ponyride's building also has a desk-based coworking portion that includes a journalist, a health coach, and the Detroit Public Theater. Even downtown Detroit's coworking scene looks different from what you might see in New York City or London. Bamboo Detroit has roughly 100 members ranging from Asia Newson, the 13-year owner of a candle-making company called Super Business Girl, to people in their 60s. About 45% of members are African American, and 40% are women, says CEO Amanda Lewan. Many Bamboo tenants are usual suspects for coworking spaces—such as game, app, and web developers and marketing consultants. It also has gigabit Internet provider Rocket Fiber and real estate developers jumping on Detroit's downtown boom. Memberships start at just $99 per month for 24/7 access. Bamboo Detroit also offers several "open days" per month, when anyone can come in to work for free, as well as free events such as panel discussions and screenings of movies, often by local filmmakers or with a Detroit focus. The company turned a profit within about six months of opening, says Lewan. "We're a for-profit company with a social mission, and our mission is to provide an affordable option and to build a diverse entrepreneurial community," she says. Bamboo is incorporated as an L3C (low-profit limited liability company), a designation in Michigan and a few other states in the same spirit as B Corps, which are recognized in other states.